It wasn’t a pretty sight, so Bruce Hampson swung into action. A large brood of quail — two adults and a host of tiny, fluffy babies — were walking near Hampson’s Wheeler Avenue home in Parksville when one of the youngsters suddenly disappeared from the line after falling through a sewer grate. Hampson lifted the grate and saw there were four of the mini quail in distress. He saved three. One drowned. To that end, Hampson said he called the city, the SPCA and the North Island Wildlife Recovery Centre. He said he believes some inexpensive steel meshes of some sort could stop this from happening again. The city doesn’t believe there’s much it can do about the situation. “Good on him (Hampson) for taking the grate out and rescuing the little guys,” said City of Parksville spokesperson Debbie Tardiff. The city has approximately 1,400 catch basins like the one that felled the tiny quail on Wheeler Avenue. “Realistically, it is not manageable to run around and put screens on them,” said Tardiff. Robin Campbell of the North Island Wildlife Recovery Centre also didn’t believe there’s much his organization could do about the issue. This entry was posted in Health, News, Quail and tagged Animals, Bird, eggs, Hunting, North Island, quail, Quail Egg, Recreation on June 25, 2013 by naturalpfg. The northern bobwhite is the native quail species found throughout Arkansas. These predominantly ground-dwelling birds are primarily found in areas that contain large amounts of edge habitat. Edges are boundaries between different habitat types or land use practices. The home range of a quail covey can cover as little as 20 acres up to 160 acres. 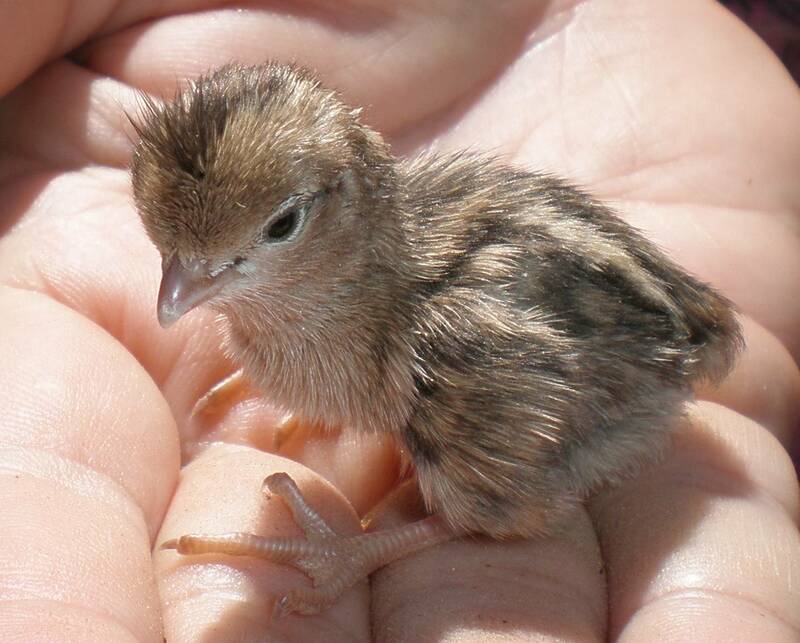 In that home range, quail require various types of habitat, including: escape cover, nesting habitat, brood rearing habitat and feeding and loafing areas. So, what is a “covey headquarters” and how does it fit into the equation for great quail habitat? Covey headquarters are patches of escape cover with dense, shrubby canopy cover and little ground-level vegetation. Headquarters are used by quail on a daily basis to provide protection against severe weather and predators along with resting and loafing areas. The percentage of the landscape designated as covey headquarters can range up to 20 percent of the total area, with the remainder set aside for the other habitat components needed by quail. Covey headquarters should be provided in clusters of not less than 30 feet by 50 feet blocks of shrubs that are not more than 150 feet apart, which will allow the quail to have quick access to their escape cover if the need arises. Shrubs that serve well for this habitat component include: wild American and Chickasaw plum, fragrant and smooth sumac, rough-leaved dogwood, deciduous holly, cockspur hawthorn and American beautyberry. Plum thickets are an excellent example of quail convey headquarters and occur naturally on many properties across Arkansas. Existing Thickets — Protect and manage any existing plum or other shrubby thickets on your property. These shrubby thickets can be improved to better benefit quail. If invasive grass species take over the ground-level cover, those grasses should be treated with a herbicide, timing depending on whether they are warm season or cool season. This will re-open that ground-level cover making it easier for quail to move throughout the headquarters. Also, any over-hanging or adjacent trees to the plum thicket should be removed from the area. This strategy will help reduce predation from overhead predators and also provide a clear flight path for quail to escape from ground predators. Creating Thickets — If thickets do not occur naturally on your land, they can be established by planting seeds, seedlings or container-grown shrubs. For beautyberry, dogwood and sumac, spacing should be on a 3 foot by 6 foot spacing. Other shrubs can be planted on a 5 foot by 8 foot spacing. Just remember, thickets intended for use as covey headquarters should be established in edge habitat, those areas of transition between habitat types and in open fields lacking shrubby cover. After you have identified the best location for your headquarters, the existing vegetation should be controlled using an herbicide before you plant the shrubs. This will promote the growth of your new plantings as well as open the ground-level cover to facilitate quail movement throughout the new headquarters. Headquarter Maintenance — Whether you have existing or newly planted covey headquarters, you should avoid damaging these when conducting other habitat management practices on your property, i.e. prescribed burning or disking. Herbicides can be used to control invasive grasses within and around your thickets; however care should be used to avoid spraying shrubs. Also, livestock should be excluded from these areas to maintain the integrity of the thicket as a quail covey headquarters. This entry was posted in Feeding, Free range, Health, Housing, Quail and tagged Animals, Arkansas, Bird, eggs, poultry, quail, Quail Egg, United States on June 25, 2013 by naturalpfg. Many mothers struggle to adjust when their babies grow up and move away to university. But one particularly protective mum was causing chaos on campus yesterday as she viciously attacked students trying to get back to their halls of residence. 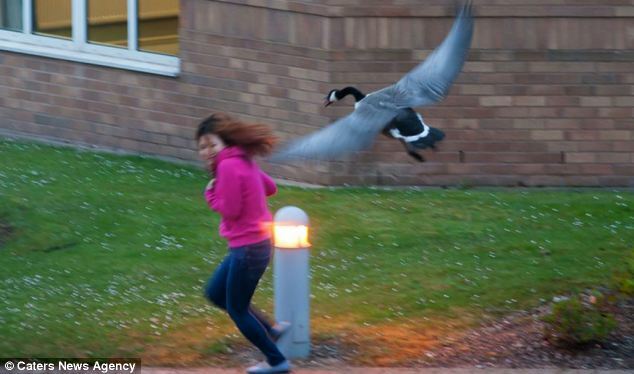 The furious Canadian goose built her nest close to a block of student flats at the University of Warwick and then refused to let anyone pass while she waited for her eggs to hatch. 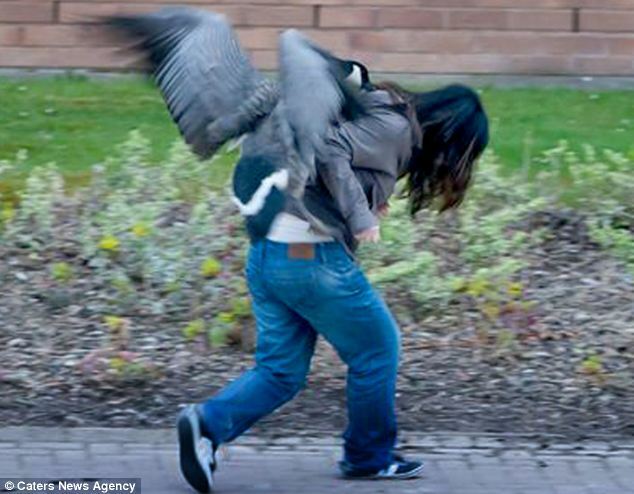 Terrified students were left too afraid to leave their homes after a series of aerial attacks from the goose who pecked, squawked and chased them. 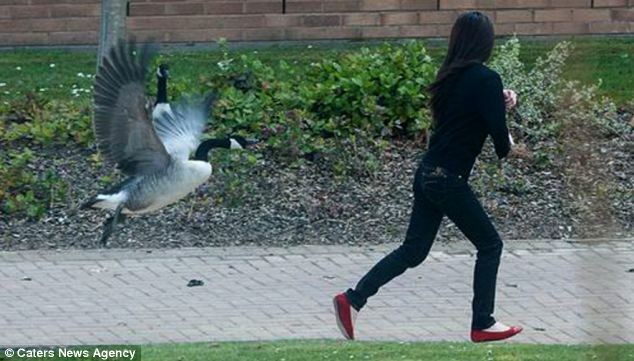 Many were wearing headphones or talking on the phone and didn’t notice the goose’s warning hiss until it was too late. Some were forced to run for cover as the angry birds attacked while others even threw themselves to the ground for protection. Business Management student Zhi Chow, who lives on the campus in Coventry, West Mids, set up a camera to capture the siege. 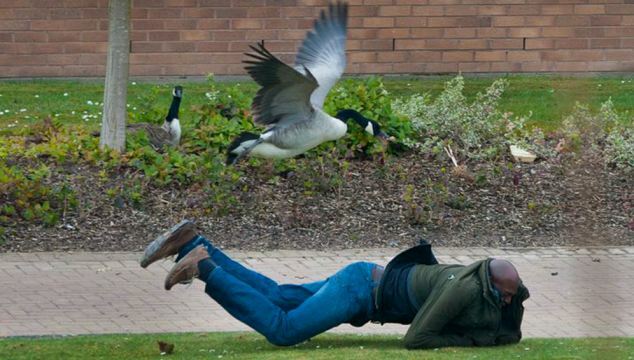 One picture shows a terrified man hurling himself to the ground, covering his head, as one goose launches at him from mid-air. In another, one girl eyes up the bird sitting on the nest unaware that its mate is lurking behind her, ready to attack. 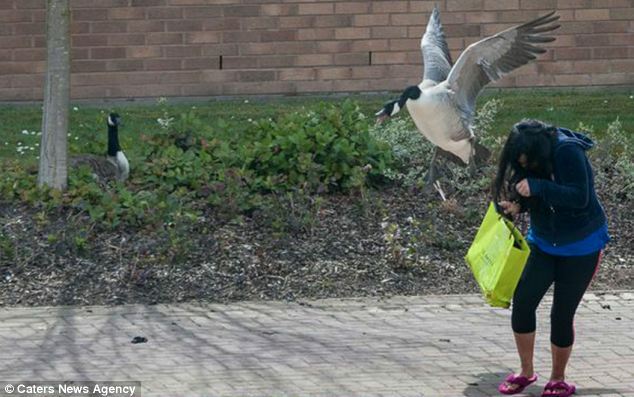 Mr Chow said: ‘I thought it was hilarious when I first saw people being chased by the geese. ‘It’s not so funny when you’re walking past them though. ‘They’re terrifying – the birds are so big and they’ll clearly stop at nothing to protect their eggs. ‘My bedroom window looks out directly onto their nest, so I set up a camera to capture the attacks so I could show my friends. 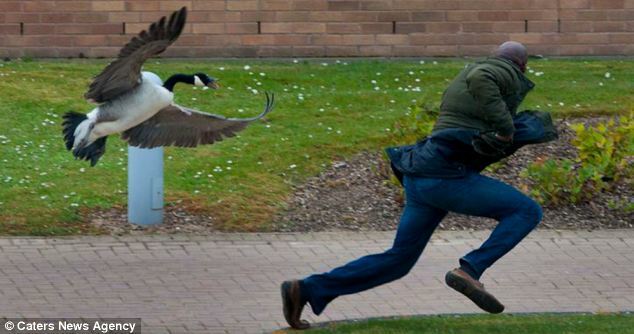 ‘Lots of people have started avoiding the area as word spreads about the geese. The mother goose’s efforts to protect her young were rewarded last night when her goslings finally hatched. 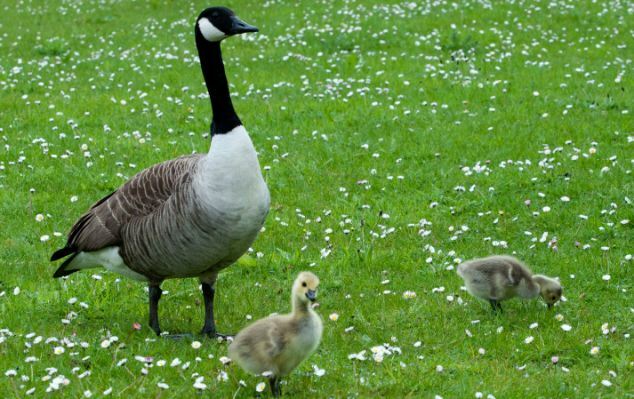 This entry was posted in Geese, Humour, News and tagged Angry Birds, Bird, Campus, Canada, Canada Goose, Coventry, Duck duck goose, University of Warwick on June 25, 2013 by naturalpfg. Having the right kit on hand means you won’t be caught out when one of your birds is off colour. If you are new to keeping chickens, picking up any poultry magazine or visiting stockists of poultry equipment and feeds can prove a little daunting given the amount of kit on sale. You will want to do right by your birds and ensure the husbandry of the flock is spot on, but are what essentials should you invest in? Torch – it’s often easier to handle and treat chickens after they have gone to roost; they tend to be much calmer then and can be easily handled. It does mean you will be working in the dark, so you’ll need a torch. Investing in a good-quality head torch, particularly one that has adjustable beam strength, will mean you have both hands free to deal with the chickens. Scissors – a strong, sharp pair of scissors for cutting string, bandages, plasters and most of all, flight feathers, if there is a flighty one who keeps jumping out the pen. Toenail clippers and nail file – most chickens will keep their toenails worn down by scratching around, but birds kept indoors or on soft ground may require a bit of a pedicure. Plus you may need to attend to the spurs of some cockerels. Leg rings – having a range of leg rings in different colours and sizes means you can quickly and easily mark an individual bird. This can be particularly useful if administering treatments to the flock and will help identify those who have been treated from those yet to be dealt with. Pliers or wire cutters – these are not only useful for emergency fence repairs but are also ideal for quickly removing plastic leg rings. Feeding syringes – a collection of different-sized feeding syringes are essential for administering fluids such as medicines down the chickens’ throat. Latex disposable gloves – these are not a frequent requirement. but when it comes to vent-related problems such as a prolapse or vent gleetthey can make the task much easier for the keeper (and probably more comfortable for the chicken too). Vet’s antiseptic spray – ideal for treating minor wounds to birds but can also double up as anti-feathering pecking spray in minor cases of plumage pulling. Petroleum jelly – not only does this serve well as a lubricant for sticky catches and locks it can also be applied to the combs of birds during extremely cold weather to reduce the risk of frost bite and applied to dry patches of skin on the face or legs. 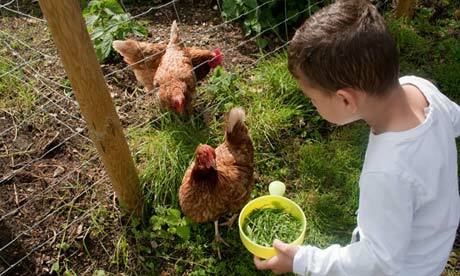 It’s also handy when treating for scaly leg mite on the chickens should they become infested. Cotton buds – for delicate tasks such as cleaning around the eye or nasal passages of the birds. Purple spray – works in much the same way as the vet’s antiseptic spray, however it has the advantage of being visible. This means it can also be used to quickly and temporarily mark birds, either post-treatment or for further selection. Don’t use on chickens you intend to exhibit, though, as it can be difficult to remove fully. Pet carrier or dog crate – you can never have too many pet carriers for transporting or quarantining chickens. Plastic dog or cat carriers are ideal for single or small numbers of chickens, but be sure to disinfect after each use to avoid any possible transferral of pests or diseases. Vet’s telephone number – it may not be necessarily needed by you, but if you have friends or neighbours looking after your stock when you are away it could prove invaluable. This entry was posted in Chickens and tagged Agriculture, Animal, Bird, chicken, Home, poultry, Rural Living, United States Department of Agriculture on June 20, 2013 by naturalpfg. Summertime is almost here, which, for New York City’s goose population, means it’s molting season. Ordinarily, it’s a time for the birds to shed their wing and tail feathers and grow new ones in preparation for migration. But since 2009, when a gaggle of migratory geese led to the “Miracle on the Hudson” emergency plane landing, it’s been the season when U.S. Department of Agriculture Agents scour New York’s Parks for the temporarily flightless geese, round them up, and slaughter them. The geese that caused the 2009 crash weren’t local to New York, and several biologists and aviation experts–like Ron Merritt, former Chief of the Air Force’s Bird Aircraft Strike Hazard Team–believe goose slaughter is ineffectual in preventing aircraft strikes, yet the practice continues. Last year, at least 750 geese were killed. One group, however, hopes to defend the birds’ lives. Calling themselvesGooseWatch NYC, the volunteers will patrol parks where goose roundups have occurred and watch over the animals. GooseWatch began in May of last year, and thus far, neither Karopkin nor any of his volunteers have encountered a roundup in progress while on patrol. Karopkin notifies the USDA when and where patrols will happen, with the hope that it may stop agents from coming out. Officially, volunteers are not instructed to actually intervene–cell phone photos and recordings are encouraged–but off the books, it’s a different story. This entry was posted in Geese, News and tagged Bird, goose, New York, New York City, Park, United States Department of Agriculture, US Airways Flight 1549, USDA on June 19, 2013 by naturalpfg. FRANCE – A new study shows that growing geese can be fed loose-mix without adversely affecting their performance of feeding behaviour. Based on their results, the researchers recommend loose-mix feeding for growing geese because it influenced their feed behaviour only slightly but increased the birds’ weight at the end of the growing period. The aim of the trial, published recently in Poultry Science, was to study the influence of loose-mix feeding on behaviour, feed intake and bodyweight of growing geese. First-named author, J. Arroyo from the University of Toulouse and co-authors with INRA and ASSELDOR explain that they divided 252 day-old geese (Anser anser) into two groups differing in the form of diet they received between 42 and 98 days of age (AMEn 11.55MJ per kg, crude protein 16 per cent): a complete pelleted diet containing 500g of sorghum per kg (control group) or a mixture containing 500g of protein-rich pellets and 500g of sorghum whole seeds per kg (mixed group). Feed intake was measured daily from 42 to 48 days and every three days from 49 to 98 days. Individual bodyweight was measured weekly from 42 to 98 days. Goose behaviour was monitored by the scan sampling method throughout the experiment, which was divided into five periods according to the timing of access to feed: period 1 from 42 to 55 days (ad libitum feeding access), period 2 from 56 to 62 days (2 + 2 hours feeding access), period 3 from 63 to 70 days (2 hours feeding access), period 4 from 71 to 94 days (1 hour feeding access), and period 5 from 95 to 97 days (3 hours feeding access). Over the whole period, the feed intake (13,968 and 14,480g) and the feed conversion ratio (8.53 and 8.15) were similar in both groups (P=0.112 and P=0.168; respectively). Body weight was similar in both groups from 42 to 91 days of age but at 98 days of age, bodyweight was 3.7 per cent lower in the control than in the mixed group (P=0.006). Goose behaviour was influenced by period because the percentage of birds feeding increased when the daily access time to the feed decreased (P<0.001) but not by group (P>0.05). This entry was posted in Feeding, Geese, Health and tagged Arroyo J, Auvergne, Bird, Canada Goose, France, goose, Greylag Goose, University of Toulouse on June 19, 2013 by naturalpfg.